When it comes to wedding planning, choosing the perfect wedding venue is by far one of the most important things you need to decide in advance. After all, you don’t want to be stuck with a venue that you are not happy with, just because the location you actually want is not available on your wedding day. The wedding venue and location you decide on is not only a matter of convenience but also what fits the kind of wedding you have in mind. Here are a few things to keep in mind when selecting a location and venue that’s right for your wedding: Choose a location that is geographically viable to you, your family and a major part of your guests. For instance, if you have always dreamt of an exotic out-of-town location, you’ll also need to think about the logistics involved to get everyone to the venue and back home as well as factors like accommodation. 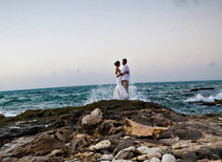 A unique destination wedding is one that many dream of, so get started with a wedding planner at the earliest, so that the cost of the wedding and other factors are in place with no confusion whatsoever. 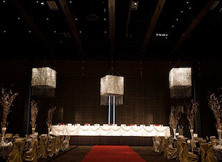 Secondly, in compliance with the theme and wedding style, you’ll need to select a venue that sets the right ambience. You’ll need to think about whether you want to have a day or a night event, a formal wedding reception or an informal pre-wedding party, an indoor or an outdoor wedding. 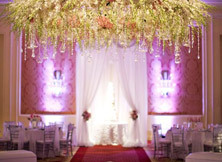 Consider different venue options like palaces, gardens, hotels, ballrooms; luxury resorts etc. to find one that suits the ambience and theme you are aiming for. Another important point to be kept in mind is the number of guests attending your wedding. For this reason, make sure that RSVPs are in check at the earliest so that you can confirm the seating capacity at the reception venue. This will also help you decide what size your venue needs to be and you can shortlist further. Marry Me – The Wedding Planners will source and recommend locations and marriage venues for your wedding events based on your vision and wedding budget – from the traditional to the out of the ordinary. We will help you choose and finalize wedding venues in Mumbai, Goa, Rajasthan and many other wedding destinations in India and internationally. With Marry Me, finding a wedding venue becomes easy, with various options ranging from wedding and reception venues to locations for beach or royal palace weddings. Goa is one of the premier destinations not only for beach weddings in the country, but around the world. This sunny state in India attracts hordes of tourists every year, thanks to its laidback charm, beautiful beaches, great restaurants and hotels, cultural tourist-spots and more. Due to its strong tourism industry and the very social yet chilled out atmosphere, there are a number of charming wedding venues in Goa to choose from. Mumbai is the land of the plenty; plenty of festivities and celebrations included! The city of Mumbai is one of the main bustling metros in India and is home to some of the most cosmopolitan mix of people you will ever find. It is also a center for various businesses, including a booming wedding industry. Wedding venues in Mumbai are the best showcase for the diversity that you find in the city; from the lavish to the budget venues, it has it all. The beautiful country of Thailand lies in the center of Southeast Asia and is home to some of the most stunning tourist spots in the continent. Thai destinations like Bangkok, Phuket, Pattaya, Krabi and more are some of the most visited cities in tourist travel today. What is now being discovered is that the wedding venues in Thailand are some of the best in the world too and perfect for exotic Indianshaadis and other types of weddings. An ancient land of royalty, Rajasthan is the largest state in India. This gorgeous state has regality and elegance par excellence and an ambience that has a fantastic combination of contemporary conveniences with old world charm. The many wedding venues in Rajasthan are something completely out of the ordinary, painted with broad brushstrokes ofthe fascinating Indian history of the region. In fact counted among one of the premier destinations for Royal weddings, Rajasthan has plenty to offer. An ancient land of royalty, kerala is the largest state in India. This gorgeous state has regality and elegance par excellence and an ambience that has a fantastic combination of contemporary conveniences with old world charm. The many wedding venues in kerala are something completely out of the ordinary, painted with broad brushstrokes ofthe fascinating Indian history of the region. In fact counted among one of the premier destinations for Royal weddings, kerala has plenty to offer.